I’m still in the midst of Bear energy at the moment, only more so, because last week, after I wrote my last post, I went down with labyrinthitis, a nasty inflammation of the part of the inner ear that controls balance. The result is dizziness, nausea and on occasion, terrifying episodes of vertigo. Controllable, as it turns out, but I’ve had better times. At present, I am living with a kind of low level seasickness which, whilst its not very pleasant, is at least managable. Confession: I am a Stationery addict! I’ve been having a bit of a planner fetish lately. I’ve always been very fond of Philofaxy, which is the filofax addict’s dream. Somehow, it doesn’t fulfil my passion for the visual, and I’ve always found filofaxes too rigid in their forms to really work for me. What delight, then, to discover Staples’ ARC discbound system, which combines the flexibility of a loose leaf format like filofax with the aesthetics and practicality of a notebook. I love what Jackie and Michelle at A Creative Operation are doing with theirs! If you want something more creative and visually oriented than the usual planners, take a peek at Right-Brain Planner. I’m not sure I could aspire to such heights of visual complexity, but its pretty breathtaking, and shows that you don’t have to conform to what Filofax says your diary should look like. If you fancy going right back to basics, you can’t do batter than iHanna’s tutorial on how to make your own! If you want to go the whole hog, and plan your entire 2014, then do what I do and treat yourself to Leonie’s Amazing Biz and Life Planner. 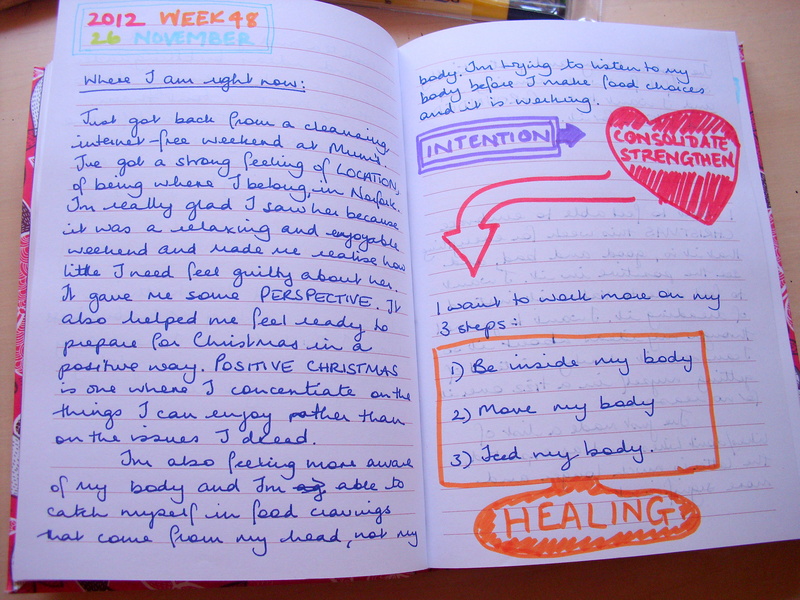 This is the third year I’ve used mine and I really love it as a way of focussing on what you want. 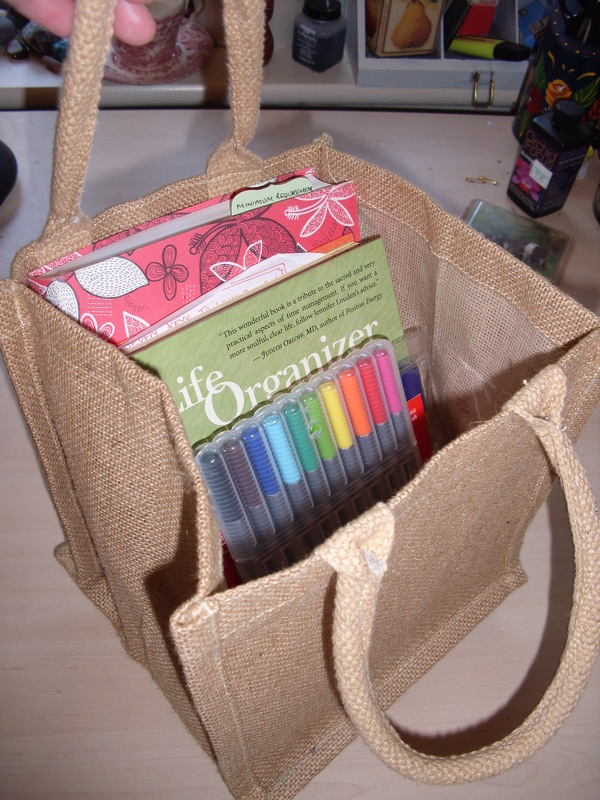 And of course, don’t forget Jennifer Louden’s Life Organiser. I use it religiously every Sunday. Fact. Meanwhile, being a bit compromised in the moving-about-without-falling-over department at the moment, I’ve been hanging my nose over the Organised Portable Home Office at ‘I’m an Organizing Junkie’. Somehow I have got to make that one work so I don’t spend my whole life struggling up and down the stairs to find notebooks or binders when I’m working on the sofa instead of at my desk! On that note, dear readers, I am going off to think about what to write about in my next post, but I hope that this one has fed your inner planner addict! This entry was posted in Creativity, Diaries, Filofax, illness, Inspiration Monday, Jennifer Louden, Life organiser, Notebook, Organising, planning, Smorgesbord, stationery, Writing and tagged ARC notebook, Creativity, discbound notebooks, Life Organiser, notebooks, organiser, planner, stationery on 03.02.14 by evenlode1967. 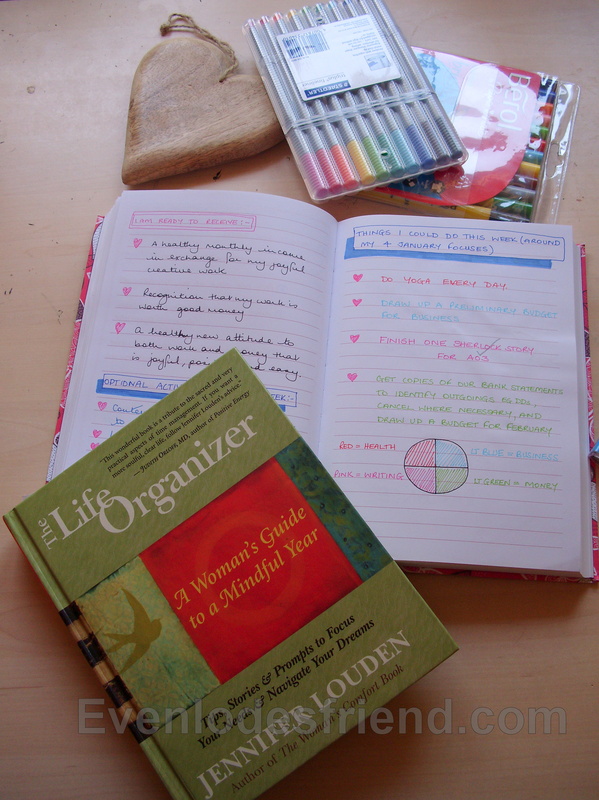 I’ve been enjoying Jennifer Louden’s The Life Organiser for a while now, and I wanted to share it with you. 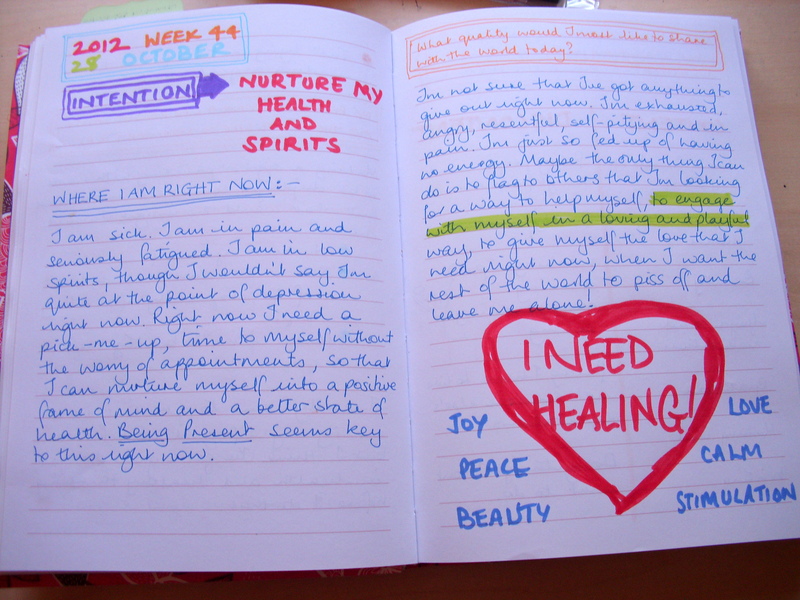 It is a weekly practise that may offer those who struggle with daily journaling an easier way into self-expression. Now I have to confess, I’ve got a bit of a thing about the whole Organising scene. It is definitely a displacement activity for me. I would much rather go out and drool over new Filofaxes than actually do the work to sort out my office. I love stationery. I love notebooks. I love books about how to organise your life. I love the websites too. Call me a GTD addict. It cons me into thinking I’m actually getting something done. I am sure many of you can relate to that! Life Coaches and self-development gurus go on about formulating your life goals, having a vision, a mission statement, working towards SMART goals, and all that stuff. Achievement, in other words. All of which is great of you actually know where you are going, and what you want. But what if, like me, you are about to fall off the edge of 45, and still don’t have a clue what you want to do when you grow up? Deciding what direction you want to push your life in is a huge project. It can feel overwhelming. Jennifer Louden’s approach is more subtle and manageable. Building on her work with The Women’s Comfort Book, and other invaluable tomes, she has written a workbook that gives the reader a chance to get in touch with their essential self, cut down empty busyness and focus on what is really important. On a week-by-week and day-by-day basis, she encourages you to think about what is going on in your life, here and now, and what you need to help you flourish. It feels quiet, comforting and manageable. And it offers you a chance to choose direction and improve the quality of your life in a gentle, incremental way. So how does it work? The book itself is a delightfully satisfying object to handle, even before you get inside. It begins with some explanatory chapters, and then sets to work. Each week of the year has a two page spread, offering journal prompts and questions to contemplate and answer, inspiring quotes and the chance to list things you have to do, would like to do, and can reasonably let go of (the latter is my favourite, because it is the most thought-provoking for me.) It is all laid out so that you can use the actual book to write in if you like, but there are inspiring examples at the front of how other women have made their own notebooks and digital documents into Life Organisers too. I was given a little bag which is just the right size to keep my organiser kit in, and my day-to-day dates diary and journal fit in there nicely too. I like to use lots of bright colours when I am answering the questions, so I include coloured felt-tipped pens, both fine and brush point, so that I can do that. I have settled on a colour scheme that I like, with particular colours for certain subjects, and that helps me if I want to check back through the pages of my notebook. … and here is what’s in it! The notebook itself is one I bought from WH Smith because I liked the cover. It has wide-spaced lines and lies open easily, which is great if I want to do a two-page spread for a mind map or such like. I try to do my Organiser on Sundays or Mondays, so I can set a clear intention for myself for the week. I like to write in my journal or do morning pages before I start on my organiser because it clears my mind, and helps me to focus on my needs rather than my complaints. I like to check my date diary or calendar before I start too, so I know what appointments I’ve got coming up, and how my time and energy will have to be distributed for the ensuing week. This is a way of grounding myself, working out where I am emotionally and physically, and what issues are coming up for me at present. It isn’t in the Louden version, but I find it useful to do. Once I know where I am, I start on the actual questions for the week. I always write out the questions in, in full, in a bright pen. (This year I am using pink, last year it was orange.) I answer in a kind of stream-of-consciousness. Sometimes a list comes out, sometimes a paragraph, sometimes a complete rant! It doesn’t matter what, it is all instructive. It tells me what is important to me at the moment, what I need to encourage and nourish myself, what I need to take notice of. From these realisations come the lists of what I could do, must do, and need to let go of. I have found it is important not to make long lists of things to get done or to force myself to release things. Once you become prescriptive, these things become OUGHTS, and just make yet more burdens to add to those we have already. I keep my list of things I could do for the week to a minimum so I don’t pressure myself. Sometimes it is just a couple of things I could think about. The lists can then be transferred over into my day to day diary and calendar if appropriate. I can make appointments to do the self-care things I have identified, and book rest time in, which I need because of my health. I put my ‘Let Go Of:’ list in the margin of my diary too, so that when I refer to it every day, I reminded of what is important to me. I think the Life Organiser is a more mindful way of keeping true to my intentions and needs than the endless To Do lists most productivity tools offer. It forms a kind of accounting process that lies on top of my journaling, a means of orienting myself in a more concrete way. Because I do it on a weekly basis, (although sometimes I miss, in which case, I don’t worry about it) it doesn’t feel so much like a chore, and I look forward to it. It keeps me in touch with myself and has helped me formulate my dreams and visions into doable agendas in a gentle way that seems far less scary than other methods. I recommend it. Get yourself a copy, and have a bash. You might find it bridges the gap between journaling and Filofaxes that you need! This entry was posted in Diaries, Filofax, Jennifer Louden, Journal Friday, Journaling, Life organiser, Nurture Yourself, Organising, Self care, Self Reflection, stationery, What to do when life gets in the way and tagged Diary, filofax, Getting Things Done, Jennifer Louden, journal, Journal Friday, Life Organiser on 12.07.13 by evenlode1967.